Another hot day dawned – we couldn’t believe it. It usually pours with rain when we’re on holiday. The family joke is never to take a holiday when we have one booked! We packed up and made our way back into Bradford-on-Avon and out the other side, following the NCN 254 signs. The route soon took us off the busy roads and on to quiet country lanes. Passing through the small village of Rudge on the Wiltshire/Somerset border, we came across a traditional old pub called The Full Moon, which looked far too appealing to cycle by without stopping. As soon as we walked into the bar, the landlady took one look at us and without a word poured us each a glass of chilled water – she could see we were melting! After a delicious light lunch, we made a supreme effort and jumped back on our bikes to continue with our hilly and hot ride. While taking a break in the shade of some trees, a walker stopped for a chat. It always amazes us how a conversation with a complete stranger can cover their life story and such random topics as the sad state of Weymouth today, technology and kids, the joys of walking, etc. On another break in the shade – we were making slow progress, it was very hot! – a couple pulled into their house, towing their vintage caravan, which they’d taken to a show. We learnt a lot about them, too! They did offer us a cuppa but we were both feeling a bit queasy, so stuck with our water. We eventually found a campsite at Gillingham, and a rather strange one at that. It was like the Mary Celeste – a couple of tents, some caravans and chalets with doors open but not a person in sight. We saw no sign of life, apart from a couple of toads (as in amphibian, not ‘personas horribilis’!) in one of the showers. A sign said that a warden would come round to collect the money but they still hadn’t appeared by the time we’d packed up next morning. Being the honest people that we are, we went looking for someone to pay. I found the office and went in leaving Chris outside to look after the bikes/gear. I realized afterwards that they must have thought I was on my own as they charged just £7. I left it at that, so maybe not quite so honest after all! 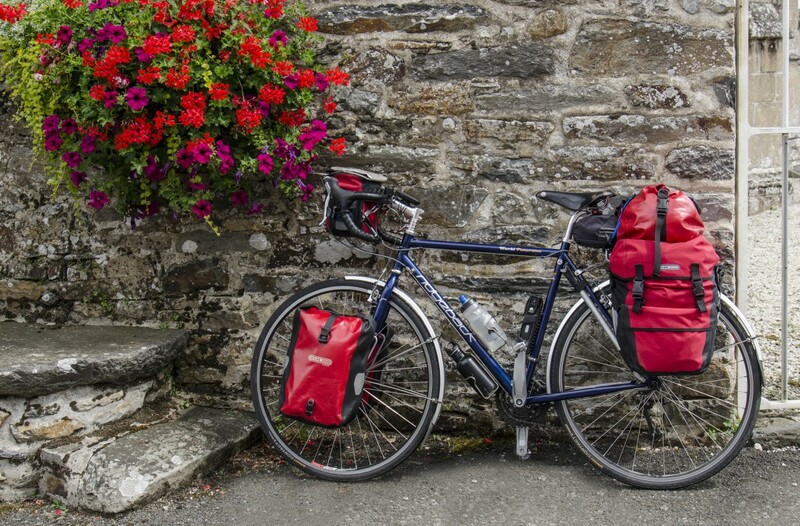 Categories: Bike, Bike packing, Camping, Cycle camping, Cycle touring, cycling, Dorset, Environment, good health, Mike McEnnerney, photographer, Photography, PhotoLink Images, Tourism, Travel | Tags: Bicycle touring, Bradford on Avon, outdoors, transportation | Permalink.